Disaster education helps people learn what to do before, during and after a disaster or emergency. Mitigation structures and planning will never protect all people in all disasters; emergency agencies may not be able to help all people. Therefore, disaster education is a critical basis for resistance and recovery in many disasters. Although it is commonly used around the world by emergency organisations particularly to encourage preparedness, there is surprisingly little academic research into understanding the most appropriate content and methods for effective disaster education. Furthermore, there is scant practical guidance into how to tailor disaster education to local hazard risk scenarios and communities. Drawing on andragogical program design from other fields (e.g. 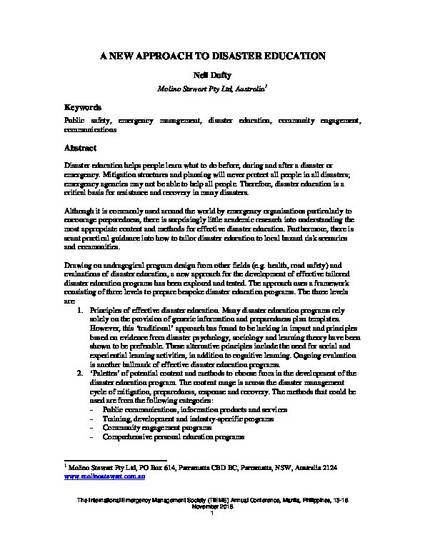 health, road safety) and evaluations of disaster education, a new approach for the development of effective tailored disaster education programs has been explored and tested. The approach uses a framework consisting of three levels to prepare bespoke disaster education programs. Using this deductive approach, the most appropriate content and methods are identified which can then be moulded into a sequence of learning activities that comprises the tailored disaster education program for an at-risk community which can be located anywhere in the world.